PROVENANCE: J.M. Hu Family Collection. Sotheby's New York, 4th June 1985, lot 74. 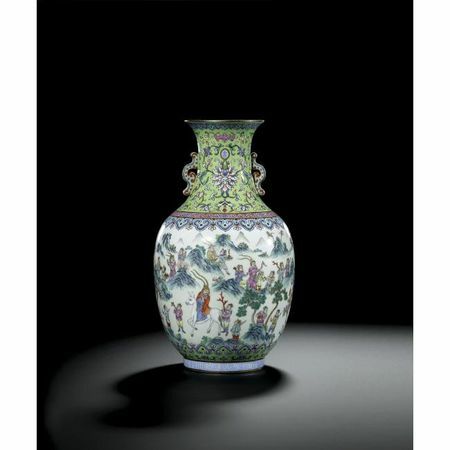 Christie's Hong Kong, 8th October 1990, lot 308. Sotheby's Hong Kong, 1st November 1999, lot 402. 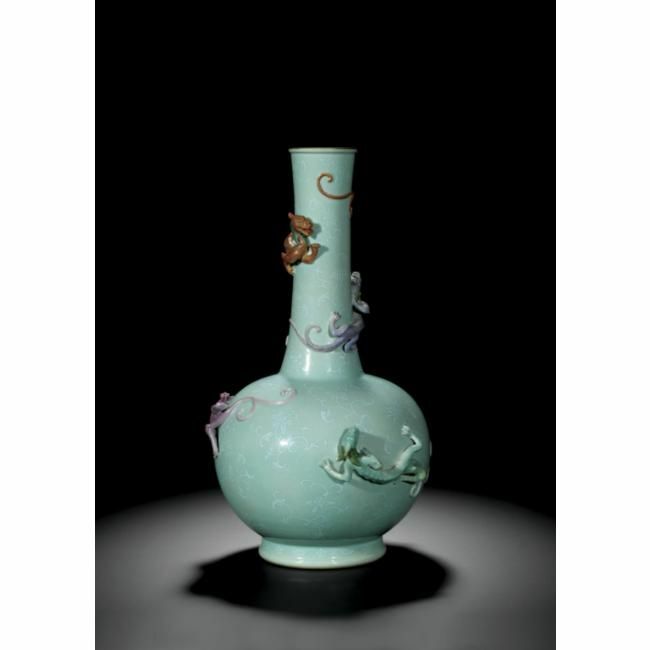 NOTE: This vase can be considered one of the finest famille-rose examples dating to the Daoguang period, and no other vase of this design appears to have been published. 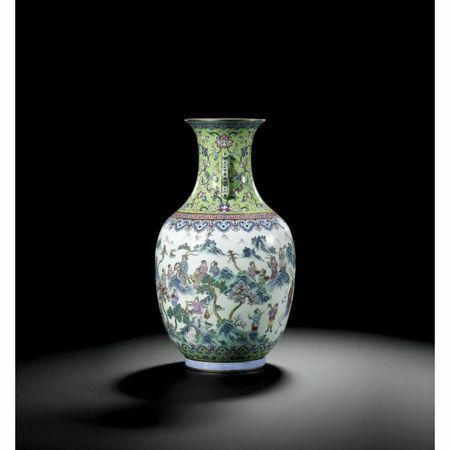 A vase of the same form, design composition and decorative borders, but inscribed with a hallmark and painted with antiques between pink ground bands, in the Palace Museum, Beijing, is illustrated in The Complete Collection of Treasures of the Palace Museum. 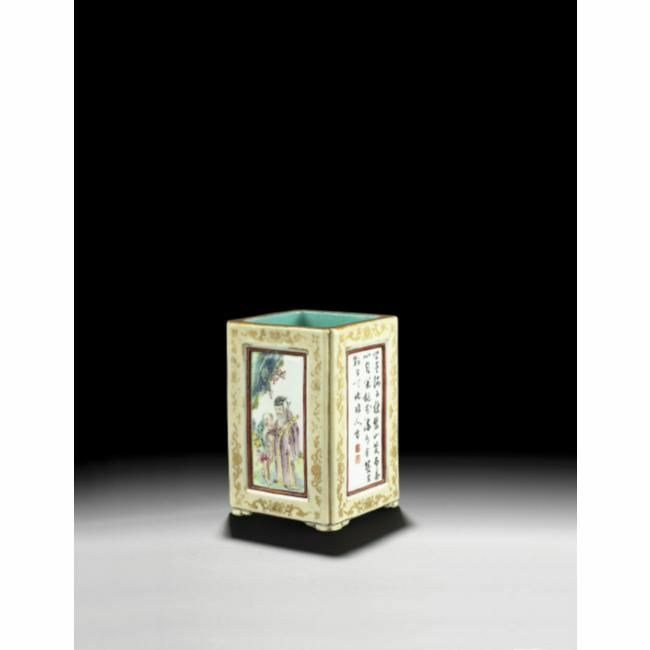 Porcelains with Cloisonné Enamel Decoration and Famille Rose Decoration, Hong Kong, 1999, pl. 188. Compare also a vase of this type depicting pomegranate trees between bands of related design on a ruby ground, but with a slightly longer and slender neck and no handles, included in the exhibition From the Dragon's Treasure, Museum fur Kunsthandwerk, Frankfurt and Berlin, 1987, cat. no. 53. 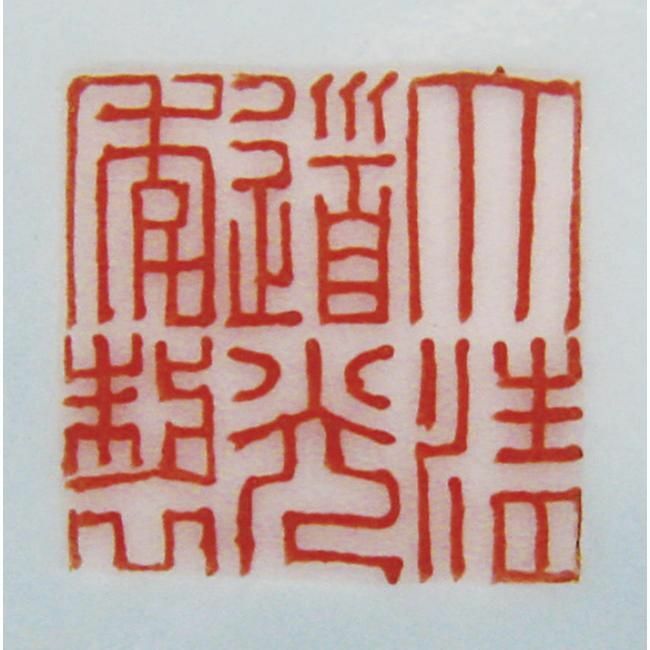 The theme of foreign emissaries bearing gifts as part of diplomatic exchanges was popular during the Qing dynasty and reflects the Imperial court's predilection for Occidental subject matters. 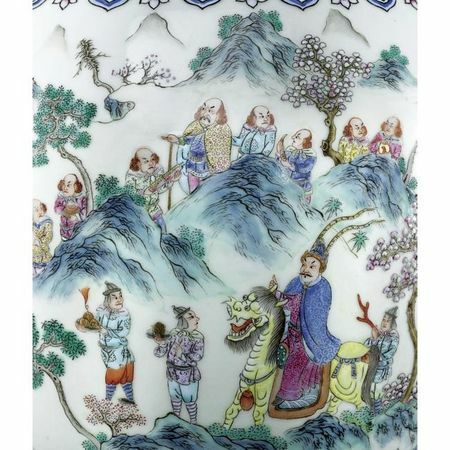 A similar scene of tribute bearers is found on a vase in the National Palace Museum, Taipei, included in the Special Exhibition of Ch'ing Dynasty Enamelled Porcelains of the Imperial Ateliers, National Palace Museum, Taipei, cat. no. 141. See also a famille rose porcelain plaque carved in high relief with a procession of foreigners, sold at Christie's Hong Kong, 29th May 2007, lot 1400.